When he joined his grandfather’s company, Akio Toyoda had a vision. Growing up with an interest in motorsports, his desire was to build a Toyota Supercar. Racing is in his blood, and he has driven under the name Morizo Kinoshita to fool the press. Rising through the ranks, he pushed back at bean counters and engineers to bring together a new team. Their goal was to build a supercar unlike anything ever seen in Japan. Wanting more power than a V8 without the weight of a V12, Yamaha was asked to develop a perfect V10. Placing the heads at an angle of 72 degrees allowed for even firing and the exhaust note of an F1 car. His Great-Grandfather invented the Toyoda Automatic Loomworks. So taking a page from his ancestors, they invented a new loom for carbon fiber. 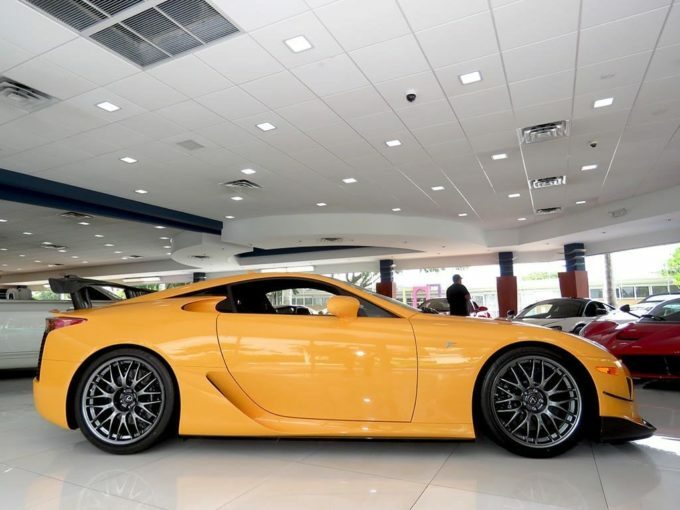 Each part of the LFA is stronger and lighter than any automotive composite before, and the bodies were fired as one-piece in one of the largest autoclaves in the Eastern hemisphere. For perfect weight distribution, the single-plate automated clutch is mounted to the engine, and it spins a carbon fiber torque tube connected to the six-speed automatic. No detail was overlooked, as even the washer fluid reservoir was placed just behind the cockpit. Next to the fuel tank, it keeps the fluids at the center of rotation, which makes for ultimate grip in the corners. Because the car took over a decade to engineer, each car cost over $500,000 to build. The company decided to take a loss to price it among the other V10 supercars. When it came to the ultimate endurance race, the Nürburgring Edition arrived ready to race. Only 50 examples were built, with a sticker price of $445,000 each. One of the fastest production cars to lap the ‘Ring, it lapped the Nordschleife in only 7:14.64. Without turbos, a supercharger, or hybrid technology, it offers 563 horsepower and 354 lb-ft of torque. Given the curb weight of 3,327 lbs, it has a power-to-weight ratio better than many current exotic cars. Fort Lauderdale Collection has a pristine example that could be yours. Click the link below for all the details and stay with us for rare & exotic cars for sale.